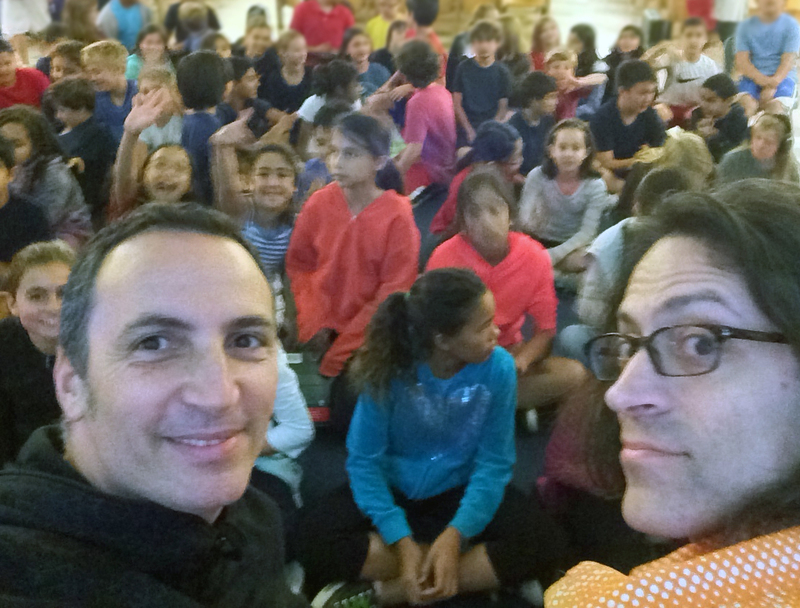 Last Friday, on Pi Day (3.14), illustrator Max Graenitz and I visited the Chime Charter School in Woodland Hills, California. Our first task: to entertain and enrich the lives of 90 fifth graders. We wound up being entertained and enriched by them. Curious about everything from my “writing process” to how Max and I met and began working together, they asked many thoughtful questions. We wrote a brief story as a group, and—-via computer and projection screen—-showed the evolution of Welfy Q. Deederhoth’s cover from sketches to finished artwork. Our second task: to address 210 sixth, seventh, and eighth graders and keep them engaged. For me, the event served as a reminder that I became a writer to get into public speaking (um, no.) Anyway, I like to think Max and I kept the students interested; they asked a long list of excellent questions and kept the conversation flowing. Special thanks to school librarian Heidi Mark, and to everyone else who made the visit possible. Max, Welfy and I thank you—and all the students—heartily. Next stop: Emerald City Comicon with Frank Beddor, author of the Looking Glass Wars series (booth #1215! Come says hello!). And check out the Upcoming Events post on this website to keep up with all Welfy doings!